We had a fantastic chance to listen to Van this morning. He really is completely inspirational. There is no way that live blogging could do him any sort of justice. So I really want you to look around and watch the youtube that I am sure will be posted soon after this conference. He rocks! His pragmatism, passion, intelligence shines through with each blazing statement. "It is going to be possible for us to get our nominee elected, but it is not going to be possible for us to get him re-elected; unless we get smart now. Start working now toward re-election-- we will be back in the situation we were in 30 years ago with Jimmy Carter." We are going to have to watch his back, while we try to save this country and in terms of environmentalism save this planet. We need to answer their drill and burn our way out of this high energy cost crisis. We need to be promotion invest and invent our way out. Drill and Burn is NOT a way out. We need to say NO. And we need to push, and promote and talk, and discuss, and activate, not tomorrow, not in November, but now. today. Check out Green for All. here are the things we need to do. 1. Change the terms of the debate. Seize the terms of the debate. 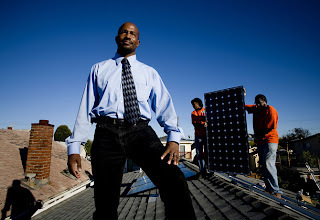 -green jobs act, green trades. get it fully funded. Green Block Grant- mayors made it. 2 billion dollars being held up in congress. We need to get them to release that money and get it out there! we are going to have a big national mobilization and rallies. Go sign up at Green for All. This is a movement that can get the goods things happening, not just stop bad things from happening. Get people working in green collar jobs. Bloggers and commenters and bloggers need to help evangelize this movement. We need a political break through. We need to re-create the kind of new deal coalition. Everything we've done up to now is the prologue. We have proven that we can build a counter to them. But when we win. We got a whole new problem. We need to prove our ideas are not just good for protesting. We need to inspire and move forward. we have to figure out how we govern from now. There is a great Green New Deal Coalition. But they are out their on their own. Mayors and local groups trying to keep the ideas alive. We need to have their backs. They need a movement, We need to help them. How can we find each other, labor, students, bloggers, activists, green companies, green mayors. We need someone to connect us all on a daily basis. That is the netroots job. That is what we can do. The challenge for us, we have to change from opposition to proposition, protest to governance. That is our moral challenge. How do we hold each other and keep each other. We have to pull people forward. We can afford now to think and talk like that. They had their turn. It is OUR turn now. Seriously this is the BEST speaker we have had this weekend. Amazing. Good ideas, passion, power and POSSIBILITY!